Claudio – the titular fool from Hofmannsthal’s early Symbolist drama Der Tor und der Tod (1894) – stands in the window of an elegant apartment, looking at the sunset and sinking into deeper and deeper melancholy. He has never lacked for anything, but despite this, life has slipped through his fingers. He is torn away from his apathy by the sound of a violin. Claudio, who has previously not known even true joy, much less sadness, realizes with horror that the musician is Death. He tries to plead with Death, arguing that it is too soon to die, since he has not yet found out what life is all about. Death decides to teach Claudio the lesson that he has not previously managed to learn. Death summons up the spirit of his mother, whose love he was not able to appreciate; the ghost of a woman whose feelings he rejected like a child bored with the beauty of flowers picked in a meadow; the ghost of a betrayed friend. Claudio falls at Death’s feet and assures Death that in an hour, he has learned more than in his entire lifetime. Up until now, he has lived as if asleep. He has woken up from his sleep only thanks to Death, who is taking him away and is astounded at how wonderful people are: creatures who can explain the unexplainable, read what no one has written and find their way in complete darkness. 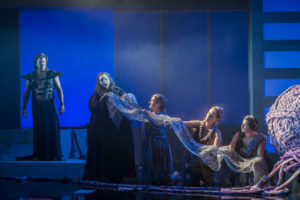 I heard Ariadne auf Naxos in Longborough and was amazed how many of these symbols made their way into the one-act opera with prologue of nearly 20 years later, which Strauss and Hofmannsthal – four years after the world première of the original version – transformed into an autonomous masterpiece. After the enthusiastically received Der Rosenkavalier, the composer-librettist pair immediately proceeded to realize two further endeavours: Die Frau ohne Schatten and Ariadne, the latter of which was conceived from the beginning as an expression of gratitude to Max Reinhardt, who had contributed immensely to the success of their first comedy, on the stage of Semperoper Dresden. The 1.5 hour-long Ariadne replaced the ‘amusing Turkish ceremony’ from Molière’s Le bourgeois gentilhomme in Hofmannsthal’s adaptation, and was premièred in this form at the Hoftheater in Stuttgart on 25 October 1912, again under Reinhardt’s direction. Despite the splendid cast (Monsieur Jourdain was portrayed by great Austrian comedian Victor Arnold, associated above all with the role of George Dandin; the role of Bacchus was sung by Herman Jadlowker, a phenomenal Jewish tenor from Latvia), Der Bürger als Edelmann set to music by Strauss satisfied essentially no one. The bored audience fidgeted in their chairs (the show lasted nearly six hours), Strauss felt almost as frustrated as the Composer from the later version of Ariadne – even Hofmannsthal concluded that putting together a decent cast would involve such enormous expense that it would be better to transform this divertissement into a separate work preceded by an appropriate musical introduction, and move the action from Paris to Vienna. The revised version – not without resistance on Strauss’ part – was premièred at the Wiener Staatsoper on 5 October 1916. Helena Dix (Primadonna/Ariadne) and Darren Jeffery (Music Master). Photo: Matthew Williams-Ellis. 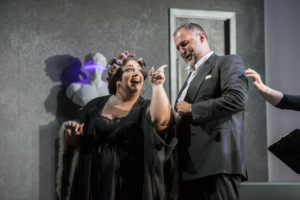 Alan Privett, the stage director of Ariadne at the LFO, did not resist the temptation to move the opera’s action to more contemporary times; according to the libretto, the opera takes place at the 17th-century residence of the ‘wealthiest man in Vienna – as one could surmise, in ‘yesterday’s world’, like something out the memoirs of Stefan Zweig, where all that remains of the past is whatever the creators have retained in their memory, having considered everything else unachievable or lost. A strong and commendable idea, except perhaps for the concept of characterizing the Majordomo as Karl Lagerfeld performing his speaking role in English – and that, with a heavy northern accent. The otherwise superb Anthony Wise went too deep into his role – personally, I would have preferred that the Haushofmeister be less involved in the decisions of his invisible master and that he convey them with comically justified indifference. The other accents in the prologue, however, were distributed masterfully: the Composer is sufficiently naïve and quick-tempered; the Music Master, sufficiently seasoned in stage combat; the scruffy Tenor and the Primadonna in curlers, ideally narcissistic; the Dance Master and the Wigmaker, like something straight from backstage at some second-rate theatre; Zerbinetta, ostentatiously vulgar; and the remaining members of the troupe, painfully kitsch. I probably need not add that the 1.5-hour picnic interval traditional at Longborough – in the case of Ariadne before the opera ‘proper’ – distinctly brought out the effect of distance to the theatre-within-theatre played out in the second part, intended by Strauss and Hofmannsthal. 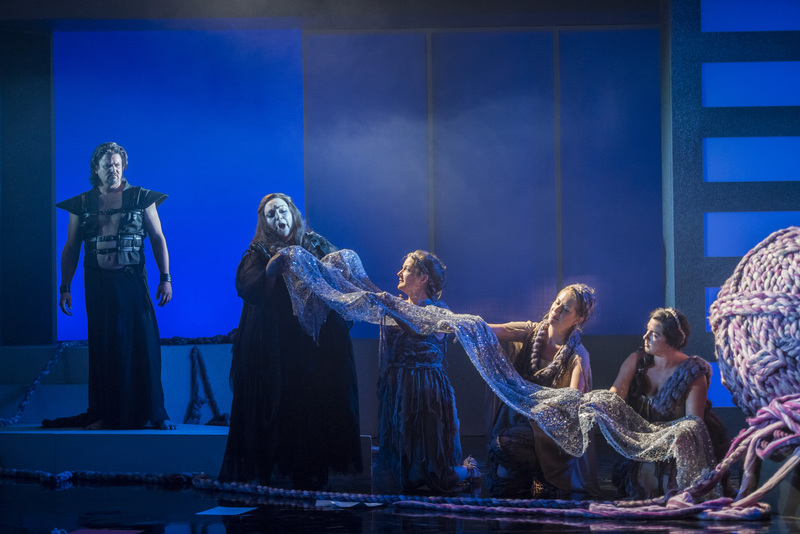 The production team left us with no doubts that the creators of Ariadne were consciously confronting the world of Greek myth with the Wagnerian ideal of limitless love exceeding all bounds of human understanding – stronger than death and only fulfilled by death. Robyn Allegra Parton (Zerbinetta) and Clare Presland (Composer). Photo: Matthew Williams-Ellis. And this is probably the most credit-worthy thing about Privett, stage designer Faye Bradley and lighting designer Ben Ormerod, whom I have praised here many times: that they allowed themselves to be convinced by the suggestions of visionary conductor Anthony Negus, whose interpretation focused above all on the character of Ariadne – a ‘one in a million’ woman, symbol of faithfulness ‘beyond the grave’, deaf to all of the voices of reason raised by the comics from the foreign world of opera buffa. Negus’ Ariadne lives in the past: she has time neither for the song and dance of flighty Zerbinetta’s suitors (‘Die Dame gibt mit trübem Sinn’), nor for the delicious, virtuosic monologue ‘Grossmächtige Prinzessin’. The daughter of Minos and Pasiphaë, not having seen the day of Theseus’ return, now awaits only Hermes, the gloomy messenger of death, not realizing that this death – by the power of art and sacrifice – can be transformed into new life. ‘Es gibt ein Reich,’ sings Ariadne, and the name of this kingdom is Totenreich, the Kingdom of the Dead. The motif of the death-bearing Hermes winds its way obstinately through her entire monologue. The meeting with Bacchus, full of misunderstandings, is accompanied by the transformation motif leading both toward the transfiguration experienced by the lovers in Wagner’s Tristan. Bacchus confuses Ariadne with Circe; Ariadne at first takes the divine stranger for Theseus and to the very end does not betray her only love, going to her death in the embrace of the supposed Hermes – though the ‘new god’ swears that ‘Und eher sterben die ewigen Sterne, eh’ denn du stirbest aus meinem Arm!’. The production team purposely modeled Bacchus upon the Tristan from the memorable show directed by Carmen Jakobi. They purposely kept distance between the two of them until the final measures of the opera, so as to all the more strongly emphasize the ambiguity of Zerbinetta’s words: ‘Kommt der neue Gott gegangen, hingegeben sind wir stumm.’ Do we give up, or do we sacrifice ourselves? Without a word, or struck dumb by the silence of death? 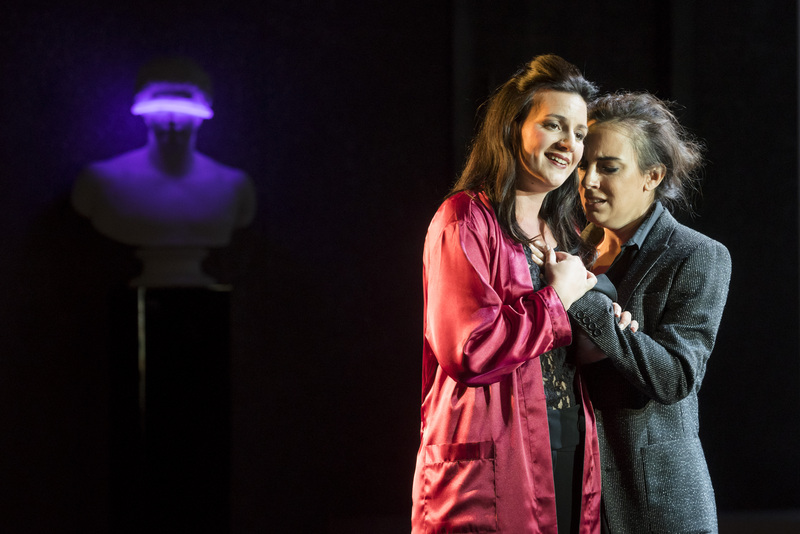 The two most important characters in Strauss’ one-act opera – aside from Ariadne, brilliantly portrayed by the Australian Helena Dix, gifted with a flexible, sensuous yet powerful, truly Wagnerian soprano – are the Composer and Zerbinetta. The first was masterfully created, in terms of acting as well, by Clare Presland, whom I encountered for the first time two years ago in Rusalka at the Scottish Opera, where she was appearing in the episodic role of the Kitchen Boy. Since then, Presland’s voice has gotten stronger and taken on power in the middle register; however, it still sounds quite harsh in the upper register. Against this background, Robyn Allegra Parton acquitted herself decidedly better: a Zerbinetta nearly flawless in intonation, technically superb, compellingly musical, flirtatious but, at the same time, predatory and frustrated – this is probably the first time I have heard in this role a singer who beneath the mask of a cynical seductress was swallowing bitter tears of loneliness and humiliation. In the roles of the three nymphs, Suzanne Fischer (Naiad), Alice Privett (Echo) and the ravishing honey-voiced contralto Flora McIntosh (Dryad) came out very well. Jonathan Stoughton has reached full form since the June Dutchman and presented the thankless role of Bacchus in a secure, freely-shaped tenor, sufficiently metallic in colour, though still not developed enough in terms of volume. In the male portion of the cast, the most impressive to me personally was Darren Jeffery (Music Master) – a singer of extraordinary culture, having at his disposal a rounded baritone superbly supported in the low register. Separate words of praise are due to Aidan Coburn, wonderfully characterized and very vocally competent, in the role of Brighella. Jonathan Stoughton (Bacchus), Helena Dix, Alice Privett (Echo), Flora McIntosh (Dryad), Suzanne Fischer (Naiad). Photo: Matthew Williams-Ellis. Negus interpreted Ariadne not so much as a virtuoso pastiche, rather as an erudite exercise in styles of earlier times – a melancholy journey into a past which in social and aesthetic terms closed behind Europe after the tragedy of World War I. He put the allusions to Italian bel canto, the œuvre of Mozart, Weber and Wagner contained in the score all the more consciously through the filter of Modernism – thinning out textures, bringing out dissonances, sometimes blurring listeners’ perception of the musical time. The orchestra, superb as usual, yielded to him completely, after the fireworks of the prologue gradually immersing itself in the poetic language of oneirism and dream phantasms so typical of Hofmannsthal’s libretti and the music of Strauss that is inseparably linked to them. Sleep is the cousin of death. Perhaps it is for this reason – now at the side of new gods – that we call in our sleep for lovers dead to us. Perhaps that is why Ariadne saw in Bacchus the irretrievably lost Theseus.